CityDash AI is the real-world knowledge graph for the public sector. The easy-to-use map-based visual dashboard captures a trillion data points from a billion devices every month to provide accurate and anonymized People Intelligence™ for city departments and agencies. CityDash AI is a GovTech 100 company, trusted by Amazon and featured in the AWS Marketplace for Smart City Solutions. You can start your free 30-day trial at any time. No credit card needed. CityDash AI is an essential tool for economic development, urban planning, mobility, transportation, smart assets, public safety, law enforcement, 311 customer service, parks, recreation programs, and city events. 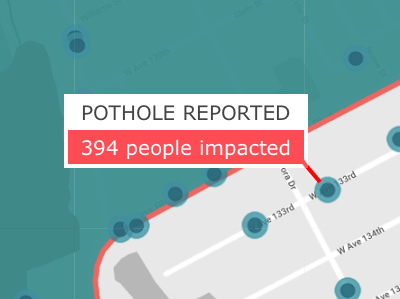 What is the impact of neighborhood noise or a pothole on the road on the people in the vicinity? Cities are inundated with 311 reports and complaints every day. 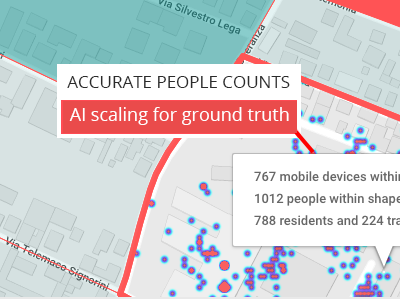 CityDash AI helps cities to evaluate the impact of a reported issue by providing a deeper understanding of how many people are in the vicinity of the issue, and might be impacted by a delayed response. Do income and employment levels correlate with neighborhood blight? 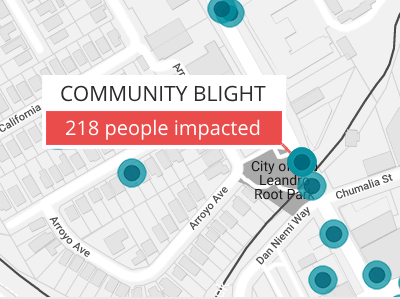 Civic complaints like overgrown vegetation, graffiti, blight, illegal postings, abandoned vehicles, shopping carts, garbage, junk, and debris can be correlated with neighborhood demographics in CityDash AI, and addressed through community outreach programs. 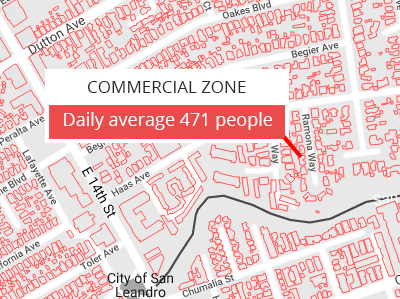 Can cities measure the health of retail businesses and downtown areas? 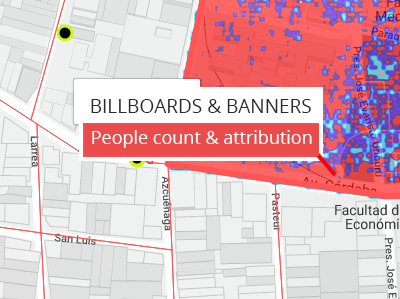 CityDash AI provides macro footfall analysis for commercial and industrial zones, as well as micro analysis for individual establishments, brands and businesses. Cities can combine such data with other indicators to evaluate and track the overall health of the local economy. Does low occupancy in commercial zones signal an economic downturn? The number of people within buildings and structures can be an excellent indicator of economic health and local employment rate. Cities can utilize CityDash AI to track the aggregate usage trends for office spaces and commercial buildings as well as libraries and community centers. How many people visited farmers’ markets? What is the trend week on week? Cities organize hundreds of events every month, from senior recreation to adult education to youth camps. Cities also host festivals, sporting events, trade shows, and conventions. 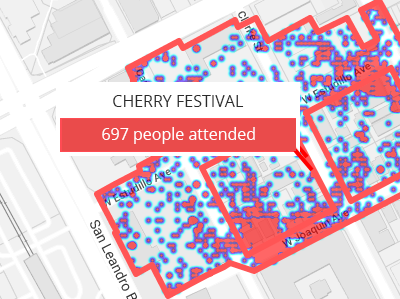 CityDash AI tracks people counts for events and provide a quantitative measure of community engagement. What are the ideal locations for installing IoT based on people density? Cities are investing hundreds of millions of dollars in deploying IoT grids and smart assets. 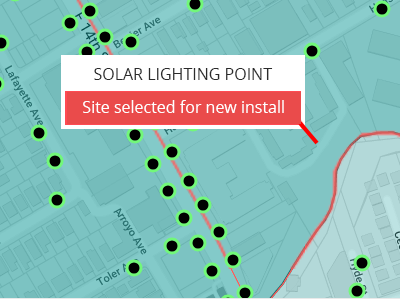 CityDash AI pinpoints the ideal locations for installing new lighting poles, cameras and sensors based on accurate historical data and heat maps of people presence, activity and movement. Are the visit trends similar for connected and legacy EV charing stations? Cities can evaluate the direct impact and benefits of their IoT grid by measuring the tracking people density in proximity of grid assets and sensors, like electric vehicle charing stations, smart displays, solar lighting points, waste receptacles, and transit stations. How many people were in the vicinity of the crime incident when it occurred? 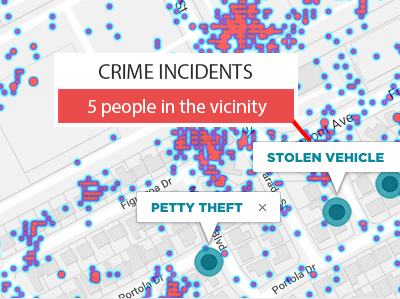 CityDash AI correlates crime data with people density through the real-world knowledge graph. Police Departments and law enforcement can leverage the graph to inform critical decisions on resource deployment and response time, and can also assist in crime analysis for case investigation. How can police departments comply with federal data reporting requirements? The FBI requires local law enforcement agencies to submit a comprehensive monthly statistical analysis of city crime data. 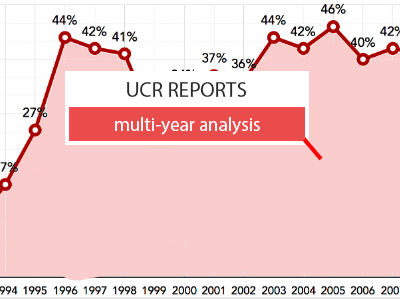 CityDash.ai saves agencies time and money by automating the UCR compute, presenting through an online dashboard as well as downloadable PDF reports. Where are people going to and from and where did they stop along the way? Cities are in need of accurate and continuously updated dispersion analysis, also known as origin-destination analysis. 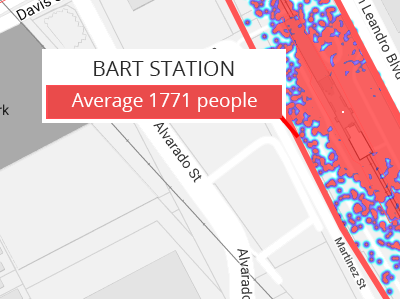 CityDash AI provides the tools necessary to understand the flow of people across different parts of the city, to and from transit stations to neighborhoods and downtown districts. Has scooter sharing resulting in fewer people opting for public bus services? Reducing traffic congestions, lowering emissions, and improving the flow of persons and goods is the #1 priority for cities and metros. 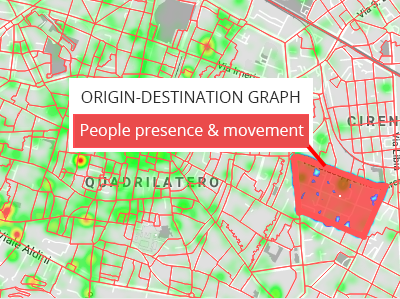 CityDash AI provides cities with deep insights about people using public transportation like trains, busses, bike-share and scooter-share services. Did residents evacuate speedily as wildfires ravaged through California? 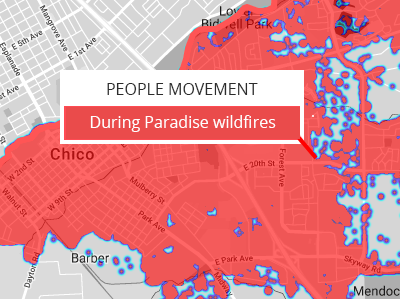 Public Safety agencies can utilize CityDash.ai to get insights into the effectiveness of established evacuation procedures for natural disasters like earthquakes, floods, hurricanes, tornados as well as accidental disasters like wildfires, explosions, hazardous material incidents. How effective were the Apple iPhone X banners and billboards last month? Cities are monetizing their real estate through real-world marketing promotions for product launches, sporting events, conferences, festivals, exhibitions, and concerts. CityDash AI provides an end-to-end platform for campaign management, analytics and performance measurement. Are more people visiting local parks, gardens and open spaces this year? 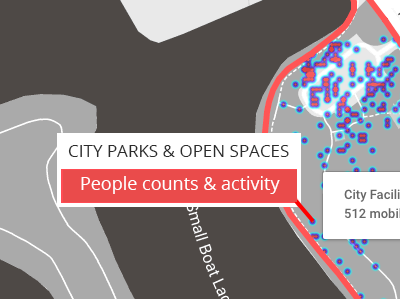 CityDash AI empowers cities to make data-driven decisions and allocate budgets and resources for parks and recreation programs based on engagement and usage. The dashboard provides people counts and visit trends by day, month, and season, along with demographic insights. How can cities evolve beyond manual people counting methodologies and community surveys? 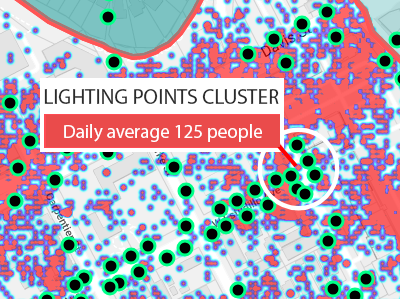 Cities are getting smarter with people counts. 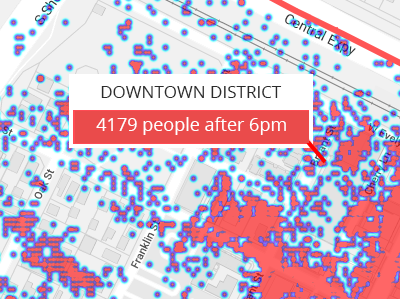 CityDash AI provides hourly, daily, and monthly pre-computed people counts based on multi-layered city shapes. The drawing tools enable cities to define custom shapes on the map, measure people presence and save the counts for each shape. CityDash AI is priced for cities on a budget. 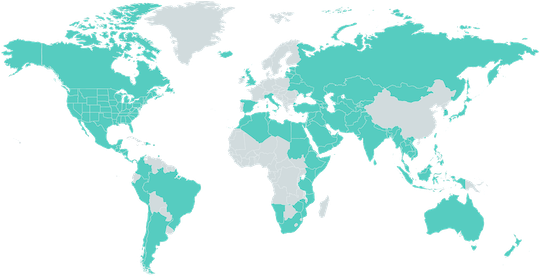 The flat-rate monthly subscription price includes unlimited accounts, unlimited usage, top-tier service and support from our data scientists and geospatial experts. You can start with a free 30 day trial at any time. You will not be asked for a credit card for the free trial.